As our name suggests, we have a Solution for you!!!! Whether its Repairs and Maintenance on your personal or Fleet Vehicles, Custom Van Fitouts, Mobility Vehicle Mods, Additional Vehicle Seating, Seat Belt and Child Restraints, Cargo Barriers and Partitons, Van Shelving and Storage Solutions, Dual Control Systems, Wheel Chair Lifters and Ramps. All Our Work is Guaranteed !! All Our Modifications come with Certification !! More than 25 years in the Territory !! We think outside the Box !! Enduroco Authorised SSM Build Facility !! Custom Design and Modifications Need a wheelchair accessible vehicle, driver training equipped car, more seats in your van, wagon or 4wd, or cargo barriers and shelving for your fleet, Just ask !! Mobility Vehicle Modifications A huge range of modifications for your vehicle, Adaptive Hand Controls, Electronic Controls, Spinner Knobs, Left Foot Controls, E Park Brakes and more !! 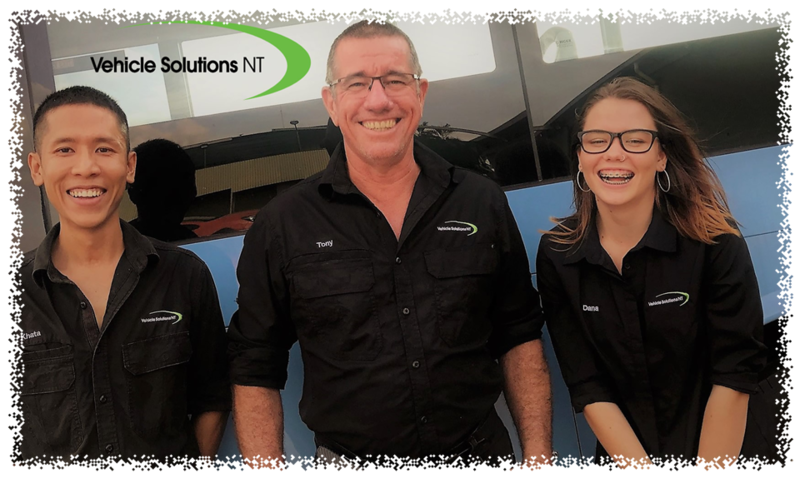 Enduroco Toyota Hiace and Coaster 4x4 The NT's authorised build facility for the go anywhere Enduroco 4x4 Coaster & Hiace, SSM & Federal Compliance makes these vehicles second to none !! Child Vehicle Safety We install and assist in fitment of your childs car seat, we are specialists in installing anchor points and modifying your vehicle to add more as your family grows ! Fleet Maintenance Services Servicing and Maintenance of all Fleets of Vehicles, Log Book Servicing and More!! Quality Mechanical Services On everything from small engines and motorcycles to cars, trucks and trailers !! Van Fitouts - From Concept to Completion Complete Installations, from floors to walls, insulation, windows, tow bars, steps, shelving and racking, lighting, vents, Roof Racks, Cargo Barriers and Partitions !! Seating and Seatbelts - Safety First A large range of Custom, seating available for 4wds, SUV, Wagons, Vans, Mini Bus, Coaches - Replacement Seat Belts, Custom Webbing Colours, Rewebbing Services !! Mobility Vehicle MaintenanceMaintenance of your existing mobility vehicle installations, reduce your liability by having the professionals inspect and maintain your installations. Special Purpose Vehicle Modifications We design and build Special Purpose Vehicles from Prisoner Transport, Patient Transport to Mobile Supermarkets , Shops and much much more ! !